Materials: sand, fabric, rose petals, sound and fragrant cinnamon essence. 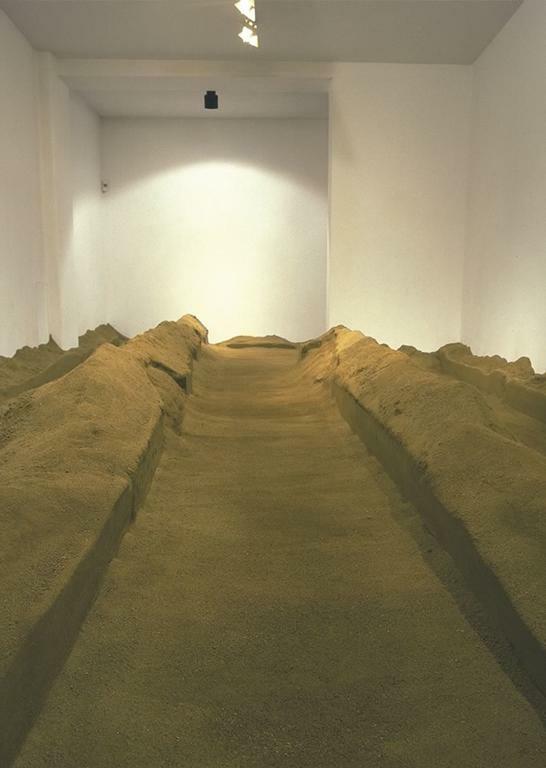 Maria Dompè transformed the environment of a gallery in Milan into spaces of passage and of meditation. The show winds its way along an olfactory, auditory and tactile itinerary inside the two rooms of the gallery. The visitors, in small groups, are invited to walk barefoot in the sand, surrounded by the fragrance of cinnamon, accompanied by the rhythmic beat of a drop that falls. 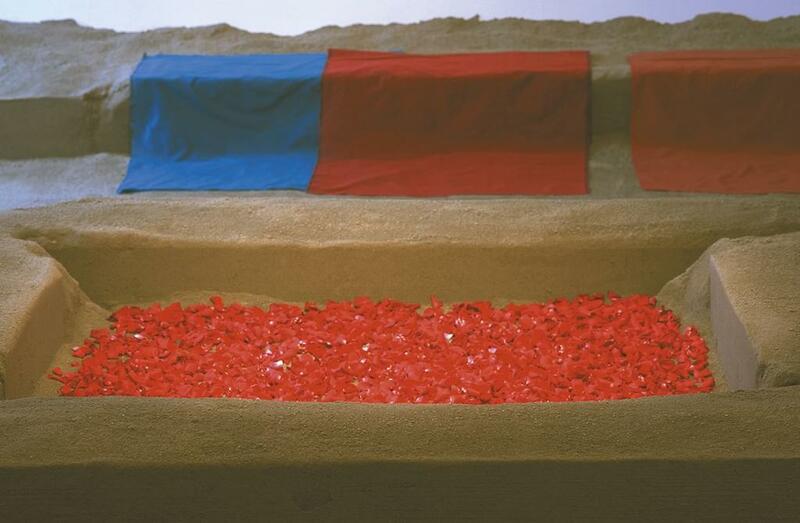 The path through the first room is a preparation for the second environment, only partially accessible, where the fabrics placed on the sand and raised at the sides evoke being without body, the colours by virtue of their liveliness return the visitor to faraway places, while the rose petals gathered at the centre allude to a boundless dimension. Daily Spiritual Life, “minute traces of daily experience” (these are the words of the artist), testifies to a spiritual life that is born in the everyday. 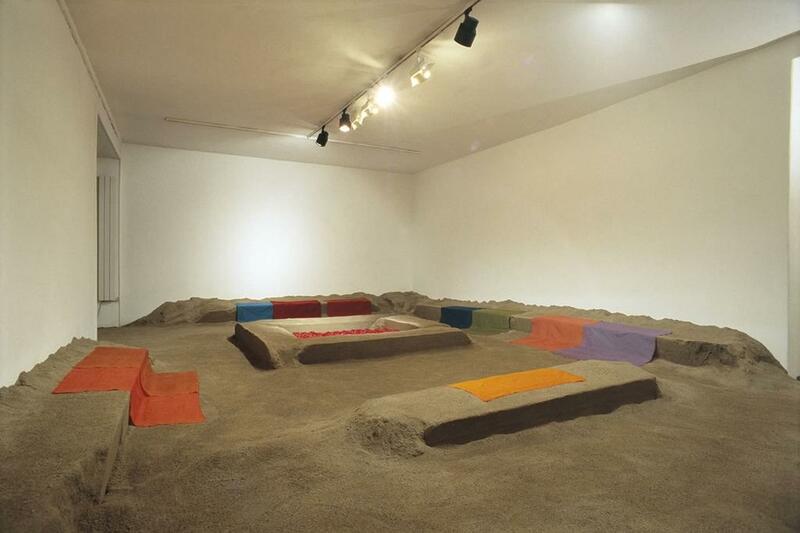 The installation is renewed by the cancellation of the footprints, repeated ritualistically after every visit in order to recreate the integrity of the whole. The transformation of the environments, in the spatial perceptions as in the atmosphere created by the sound and the perfume of cinnamon, evokes a dimension which is both far and near, familiar and exotic as in the interior life of each of us. Daily Spiritual Life, the book of the artist, was presented at the show; text by Master Mario Verri and photographs by Sergio Ciarlo; 99 copies were printed.